Hello! Thank you so much for having me guest post today. My name is Maggy and I love to craft over at Red Ted Art. This time of year I get VERY excited!! 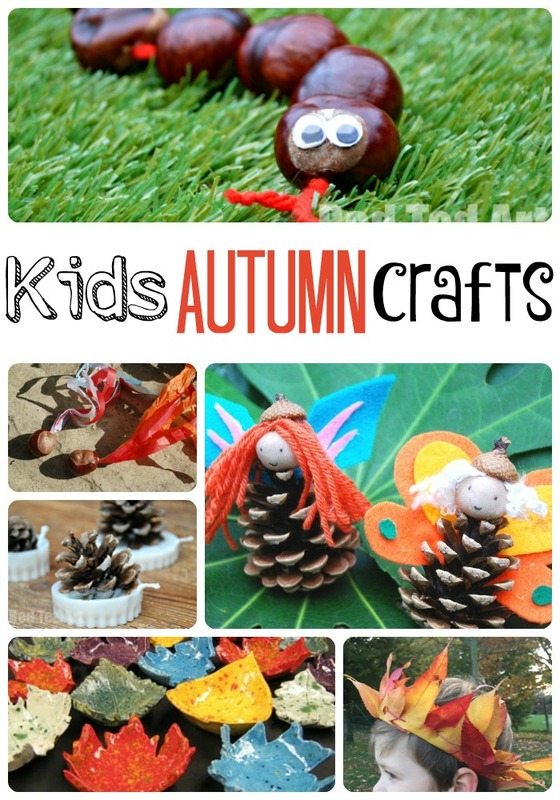 I get excited, because it is Autumn Crafts for Kids season!! Woohoo! Christmas and autumn are my two most favourite craft season for kids. I think it is because I had strong childhood memories of getting crafty at this time of year AND because there are so many lovely things to make AND so many lovely things get crafty with. Whenever you go for a walk at this time of year, you will find conkers, colourful leaves, acorns and pinecones. There are also lots of woodland creatures likes foxes, owls and hedgehogs to draw inspiration from. Today we want to share some of our favourite little autumn crafts, I hope they give you a great taster and keep you buys over the coming weeks, but we do have plenty more kids crafts for autumn if you need it! Now here is a little craft that I personally adore – Chestnut Snakes – I love them as they are super tactile and just wonderful to “fiddle with”. But you want you can also turn them into 1-10 counting snakes and even practice your number bonds! A much underated, but super simple and fun idea are these Chestnut Streamer Toy. I am not sure why the photos don’t do it just, as they are so fun to play with. Must have a go. One of our favourite Autumn crafts of all time are these oh so pretty Leaf Lanterns – we first made them at toddler group and have made similar since at school and at home. Similarly, we ADORE these Leaf bowls – a simply stunning way to (sort of preserve) leaves this season. Why not go out to the woods, build a fort and whilst the kids are busy make Leaf Crown – then crown the King of the Castle! These Pinecone Fairies are just so so sweet! Can you guess what their heads are made from? And finally.. if you have some left over candles (we used our Christmas candles actually) and LOTS of pinecones, you can quickly and easily turn them into Pinecone firelighters. They make great seasonal gifts too! Hope you love these ideas as much as we do and that you have a go very soon!! Do enjoy autumn and all the things it has to offer!!! I love the leaf crown I think we will have to do this. Oh yes, they are SUPER FUN! Enjoy!